Sie erhalten die abgebildete Pflanze. ACHTUNG: Diese Pflanze ist derzit noch nicht gut verwurzelt, wir wollen Ihnen dieses UNIKAT aber trotzdem nicht vorenthalten. Versand nur bei Temperaturen über 10°C. 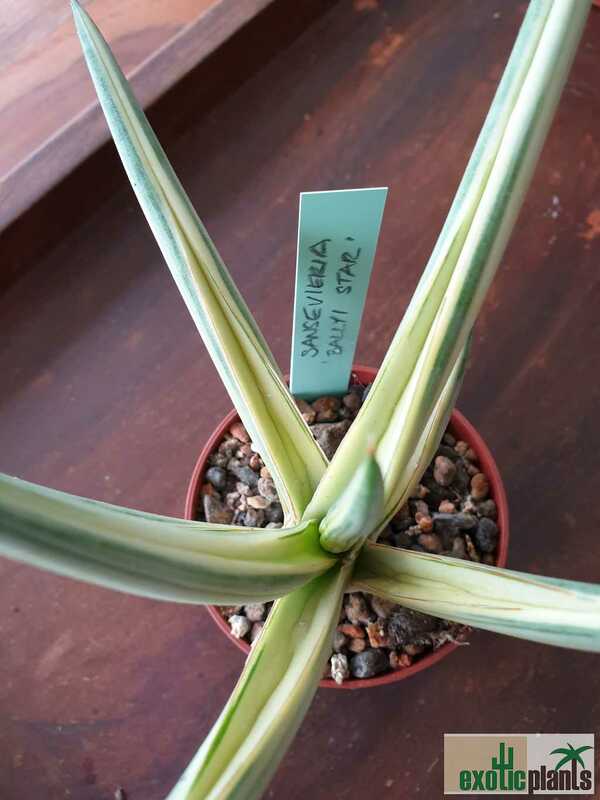 Diese panaschierte Sansevieria ballyi, es könnte auch eine S. ballyi Hybride sein, haben wir ursprünglich mit der Bezeichnung Sansevieria byllyi STAR aus Indonesien bezogen. Origin and Habitat: Kenya (East Tropical Africa, Africa). Type Locality: Kivuko Hil, a rocky ridge within a large privately owned ranch in Taita District, SE Kenya, not known elsewhere. Altitude range: 150–1000 metres above sea level. Habitat and ecology: Newton (2004) reports that Sansevieria ballyi is plentiful on Kivuko Hill and is thus not threatened. 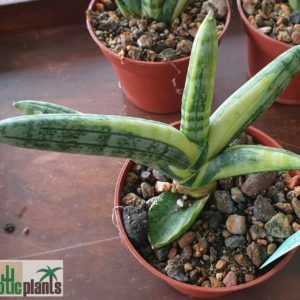 Description: Sansevieria ballyi is a small perennial succulent herb, forming patterned cylindrical leaved rosette. The dark green leaves are cross-banded in light green, stiff and only reach about 10 cm long and curve inward lengthwise to forma groove. 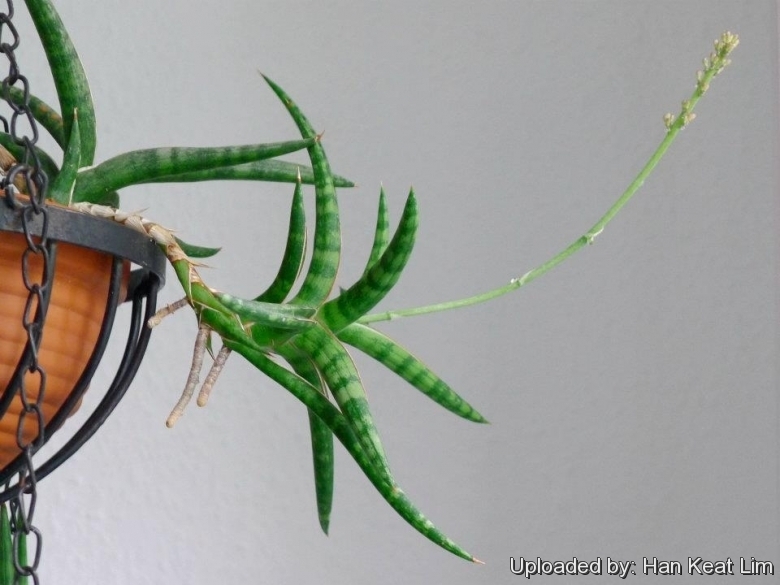 This interesting stemless plant travels’ by means of above ground, spider like, stolons that grow to about 15 cm, then sets down roots, creating a new plant. It may forms dense stands in age. Flowers are greenish white, about 2.5 cm long, clustered on a raceme to 15 cm long. 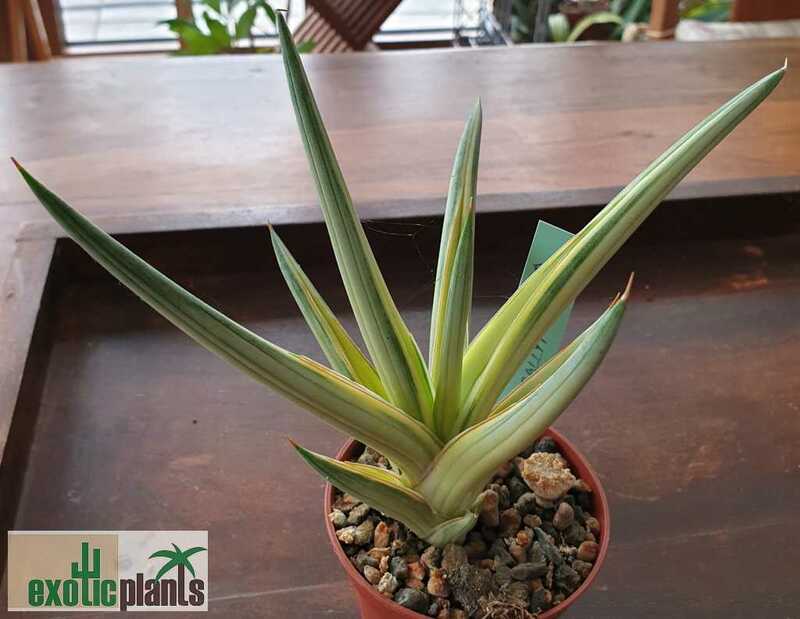 It is closely related to Sansevieria gracilis but differs in shorter stolons, shorter leaves with rough surface, distinctive colour banding and shorter inflorescence. 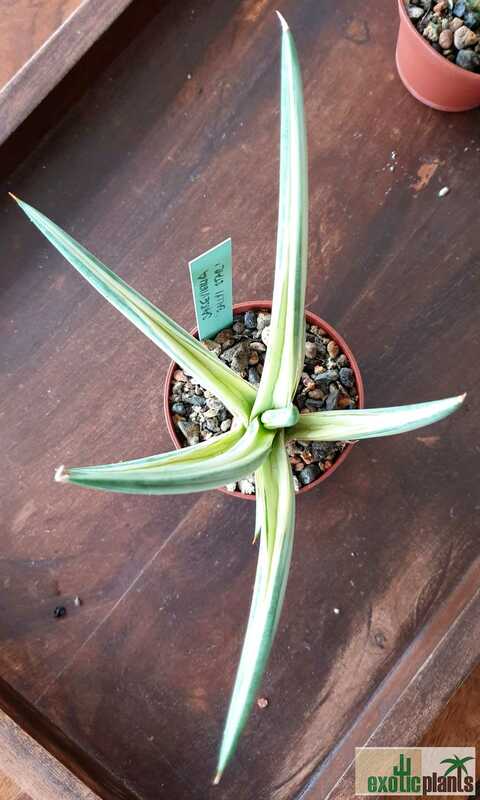 The species was only named as S. ballyi by Len Newton in 2004, although it has been in cultivation for a while and is now reasonably common, but it is often still encountered as ‘Sansevieria sp. Bally 12681’. 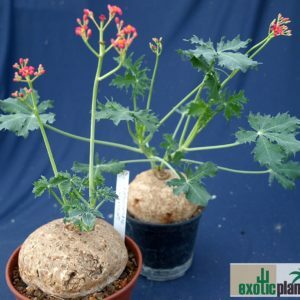 The cultivars ‘Minnie’ appears to be a dwarf form of S. ballyi with much shorter and stubby leaves and grows to about 5 cm across before sending out stolons. Derivation of specific name: “ballyi” named after Dr. Peter R. O. Bally (1895– 1980), Swiss botanist at the Coryndon Museum, Nairobi, widely travelling in E Africa, and resident in Kenya from the 1930s. It worked in Nairobi for a significant period of his life till his death in 1980. He named and described many East African succulents and is commemorated in the names of many, for example the stapeliad genus Ballyanthus (Apocynaceae). Stolons: Arising from the bases of the rosettes and so spreading horizontally above ground to about 15 cm long. Roots: Each aerial rosette produces several stilt-like roots, which can elevate the plant a few centimetres off the ground. Fine roots are produced underground and are responsible for nutrient and moisture absorption. Leaves: Rosulate, widely spreading, 6–10, laterally compressed-cylindric, 6–12 cm long, 6–9 mm thick, apex a red-brown spine to 7 mm long, grooved on the face from base to 66–75 % of the length, with alternating transverse bands of dark and light green, margins of the groove with a red-brown line and a white edge, surface distinctly rough. Scale leaves on stolons and base of rosettes, triangular, to 2 cm long and 9 mm wide, acute. Inflorescence: Simple, erect, to 15.5 cm long. Scape pale green, 3 mm in diameter. Flowers 2 per cluster. Bracts to 12 mm long, 5 mm wide. Bracteoles triangular, 3 mm long and wide. Pedicel 1–2 mm long. Flowers: Perianth tube 18–22 mm long, lobes 10–13 mm long. Filaments to 12 mm long, anthers 2–1.5 mm long. Style white, exserted for up to 13 mm. Stigma to 1 mm diameter. 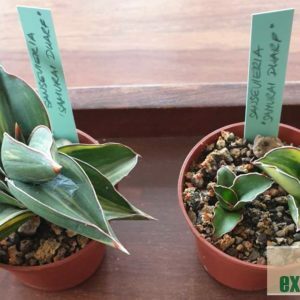 Cultivation and Propagation: Sansevieria ballyi are easy to cultivate, but slow growing and requires warm temperatures to grow. It is therefore difficult to find in cultivation. 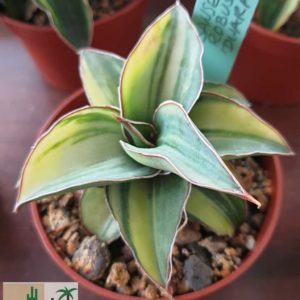 Sansevieria ballyi can tolerate shade, heat and dry conditions and grows well in almost any collection. Will thrive on any soil, under any light intensity and with any amount of water. Can be wintered in a warm or cool environment with extremely rare watering. 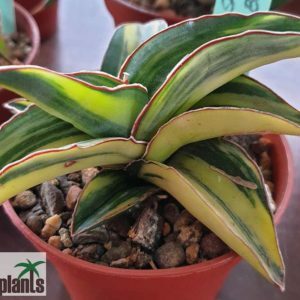 With it’s growth habit, this Sanseveria is perfect for a hanging basket or very wide pot. Soil: In cultivation, S. ballyi, like most xerophytic plants, grows best in porous, well drained soil. Use a soil mix consisting of a combination of inorganic and organic ingredients. 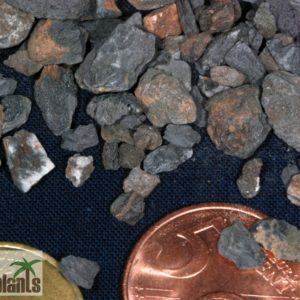 Gravel, perlite, vermiculite, and decomposed granite are commonly used to add weight and improve drainage, while bark chips and coconut coir or husks are used for moisture retention. Always underpot sansevierias. Light requirements: Will tolerate low light levels but grows best and flowers if given bright light and even tolerates full sun. 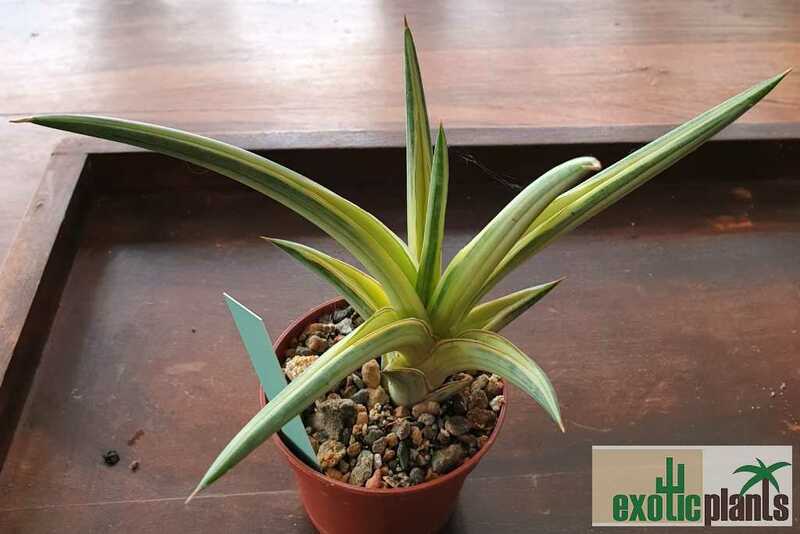 Under low light conditions the leaves may become etiolated, evident through a darker green colouration of the leaves, which become longer and thinner than usual. In the garden In mild to tropical climates it prefers semishade or shade and it is not fussy. 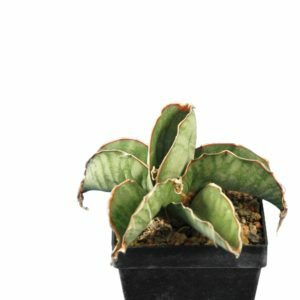 Temperature requirements: Sansevieria ballyi is theoretically hardy to -4° C, particularly when dry – but it is best to avoid severe freezing temperatures. If growing outdoors in frost free areas keep in a covered patio or under an area where plants do not receive winter rainfall. In-ground plants can tolerate light freezes if covered by deciduous tree leaf. Propagation: It spreads relatively slowly, by stolons with new plants on the ends. Vegetative propagation by division or by leaf cutting is the preferred method taken at any time. 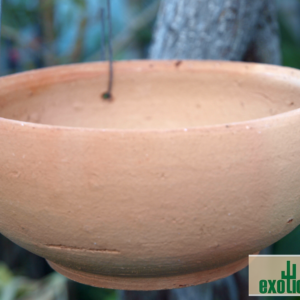 This can be done by removing and rooting the plantlets produced at the end of each stolon. Since the plantlets grow a rosette of leaves before beginning root growth, when rooting plantlets, it is very important that plantlet is not removed before it has developed stilt roots to a length of at least 3 cm. Once stilt roots have been grown to sufficient length, however, the stolon can be cut at any point and the new plant can be potted in slightly moist porous soil. Cuttings should be at least 5 cm long and inserted in moist sand. A new plantlet will emerge at the cut edge of the leaf.